The unseen C.Y.R.I.L had been hosting the letters page of Marvel UK's Star Wars comic since the STAR WARS WEEKLY era (1978-80) but readers didn't see him until 1984. Initially Marvel claimed C.Y.R.I.L was a computer, specially programmed to handle readers letters on the Cosmic Correspondence page (overseas readers flummoxed by the whole idea should know that fictional editors were a British comics tradition, albeit a conceit rarely adopted by Marvel UK) but evolved over time, becoming a droid responsible for producing the whole comic. 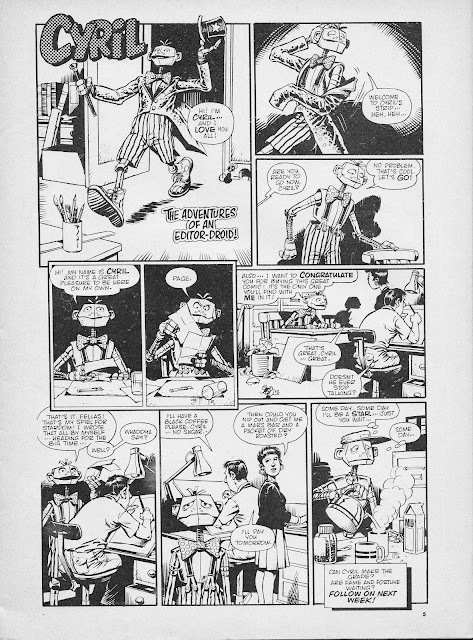 He first appeared in a series of spot-illustrations (beginning in issue 61, cover-dated 15 August 1984) before graduating to his own one-page humour strip, beginning with this opening instalment from RETURN OF THE JEDI issue 73, cover-dated 10 November 1984. The strip appeared weekly for the next year, appearing for the last time in issue 126 (16 November 1985). The weekly had shifted to Marvel's 24-page full-colour format by this point but C.Y.R.I.L's adventures continued to appear in black & white (the extra costs of a colour strip obviously more than Marvel's meagre budgets could accommodate). 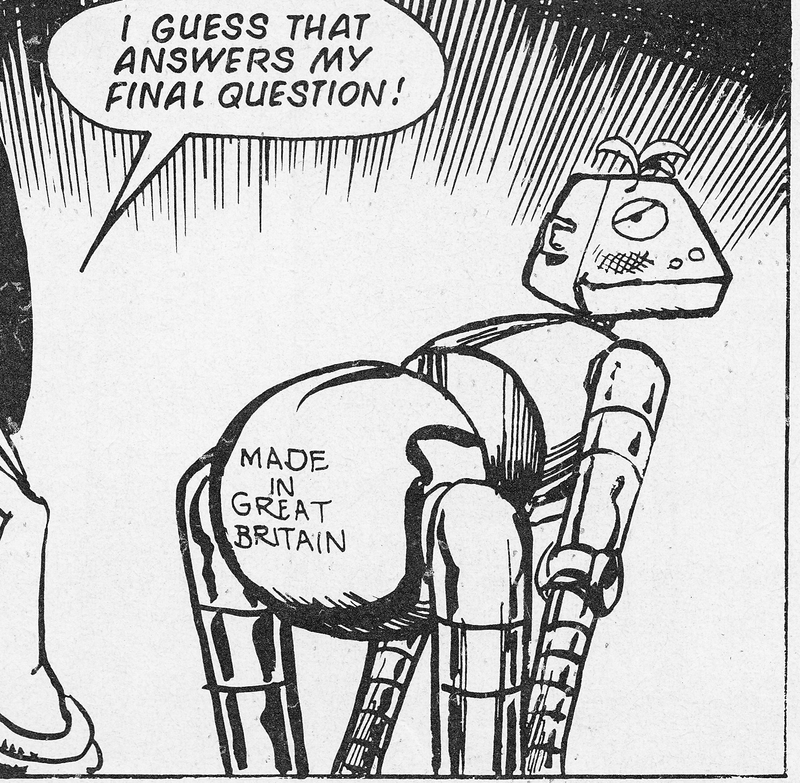 The strips were generally uncredited but the art was by Steve Parkhouse and John Ridgway, although their Wikipedia entries don't mention it. The writer is unknown. The strip take place in-and-around Marvel UK's Redan Place base. Marvel's offices were also plagued by the mysterious Secret Artist (in the pages of MARVEL SUPER HEROES SECRET WARS) during this period and the Editor Droid made occasional appearances there. RETURN OF THE JEDI weekly, still edited by C.Y.R.I.L, eventually clocked up 155 issues before merging with SPIDER-MAN AND ZOIDS. He's not been seen since.